The Swingline™ CS25-44 features a wide feed opening; making it suitable to shred large paper types. Being TAA compliant, the Swingline™ shredder is ideal for purchasing with government funds. 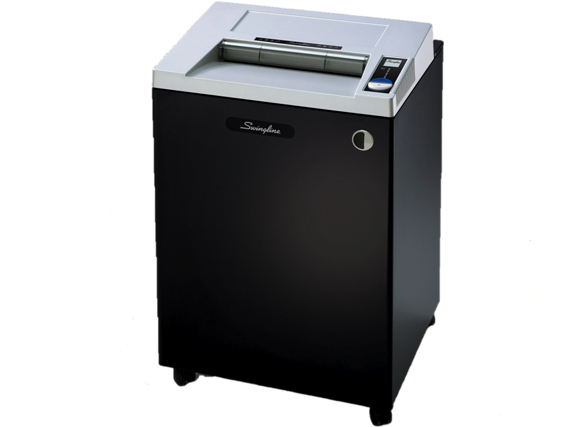 Besides shredding paper, the Swingline™ shredder can shred optical media, credit cards, staples, and paper clips. The Jam Stopper® shredder features Swingline™'s JamStopper® technology that automatically reverses during paper jam. The Swingline™ CS25-44 strip cut shredder features thermal overload protection; ensuring the motor functions without getting hot. The Jam Stopper® shredder shreds continuously without needing a break. The Swingline™ CS25-44 strip cut shredder's large waste bin saves costs as waste bags won't be bought frequently. The waste bin is a wire-frame bin, and includes a bag full indicator. JamStopper technology prevents paper jams.